The aforementioned sandwich stood about six inches tall, was filled with roasted eggplant and yellow bell pepper, as well as a tangy avocado salsa. It delivered a combination of flavors that complemented each other and is sure to please your taste buds (as it did mine). In a few words this sandwich was delicious, fresh, and simple ( and a bit messy too!). 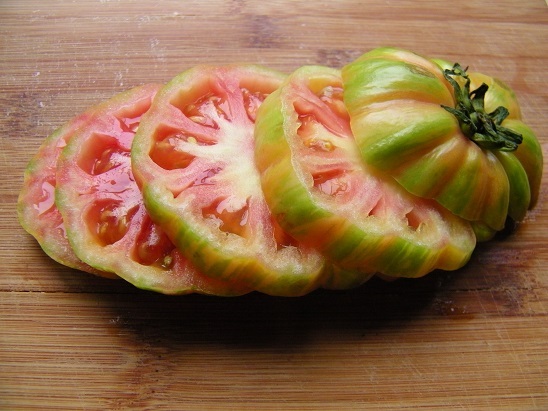 I was also overjoyed that I was able to use the beautiful heirloom tomato I’d bought from the farmer’s market. Aside from making this towering eggplant grinder and being slightly seduced by a seriously gorgeous (and flavorful) tomato, today was also my sister’s wedding shower. The shower was held at a local Italian restaurant. The food was delicious, the staff very accommodating, and the guests were all about the room mingling with my sister and other friends and family. It was a wonderful day and I am very grateful to have been a part of it. The white and blue-green hydrangea’s that we picked looked beautiful at the center of each table. 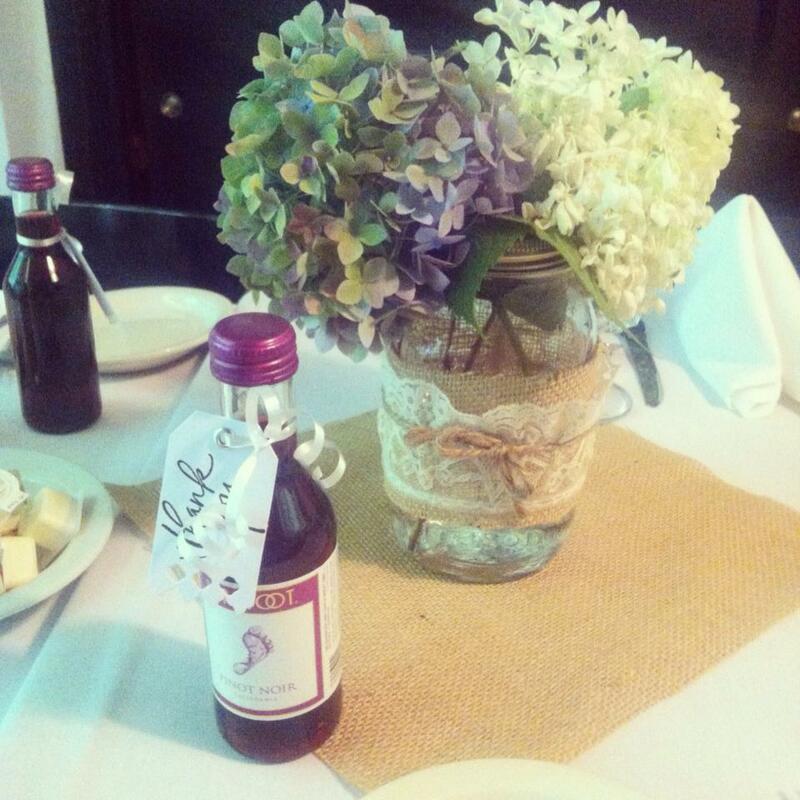 You can also see the mini wine bottle favors, which turned out to be very cute! 1. Preheat the oven to 375 degrees. Prep the veggies (by peeling some of the skin off the sides of the eggplant and slicing it about 1/4 inch thick) and halving the peppers, as well as removing their stems. Then drizzle the eggplant with olive oil and season with salt, pepper, garlic powder, and cumin. Rub the spices on the eggplant to make sure they are evenly distributed. No need to season the pepper, just add a bit of olive oil to it and put them cut side down. Cover the eggplant with foil before popping the tray into the oven for about 30 minutes (so it will retain more moisture and you won’t have to use as much oil to keep it moist). 2. While the eggplant and peppers are cooking, assemble the avocado salsa. To a bowl, add the diced avocado, chopped tomato, lime juice, jalapeno, salt, pepper, a bit of olive oil, and fresh oregano. Stir the mixture together and put it into the fridge to let the flavors combine. 3. After the veggies are roasted, take them out of the oven. 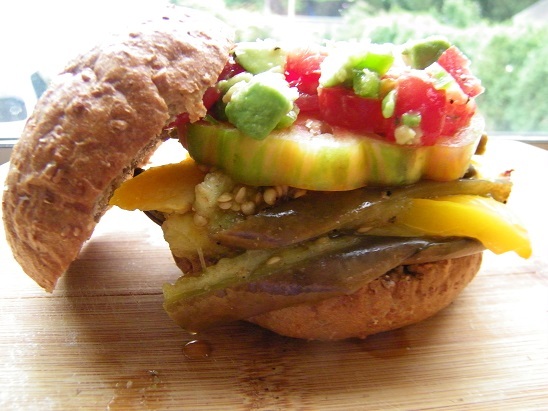 Cut the eggplant slices in half so they are short enough to fit on the buns and cut the pepper into slices. 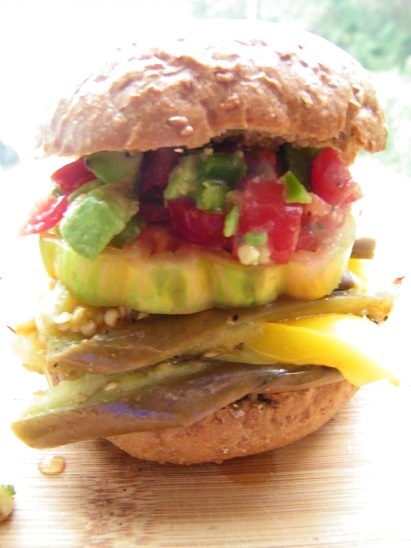 Add some roasted veggies to the sandwich and top with the avocado salsa, as well as any additional condiments. Enjoy! This filled sandwich look,amazingly delicious, my dear friend!